9 / 10 based on 1 reviews. Of the 1 people who reviewed this product 100% would recommend it. My Churchill M5 safe is perfect for our domestic needs in that it can be securely fixed in situ, it is heavy and sturdily built, it is attractively finished and it has sufficient capacity to store jewellery, passports, other document and miscellaneous items. Having carried out extensive research into safes on the market, we found many others which were of inferior quality, lesser capacity and no where near the value for money that the Churchill M5 offers. 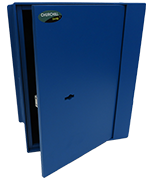 Most important of all, the Churchill M5 safe gives us peace of mind and a level of security that no other comparable product on the market can offer.